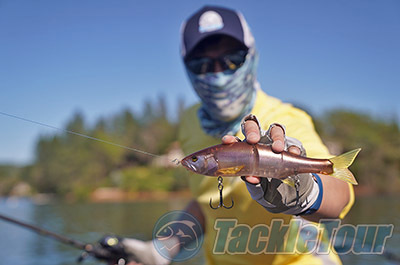 Introduction: Jackall�s stable of quality baits continues to grow, and it doesn�t matter if you are looking for plastics, frogs, blade-baits, walkers, or swimbaits, the brand has you covered. 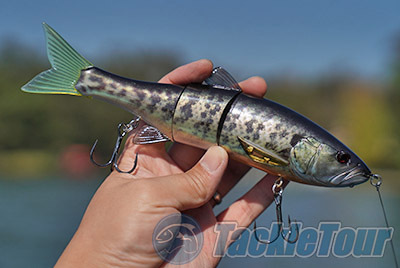 In recent seasons Jackall has continued to expand their fusion-style baits with products like the half frog and half swimbait styled Grinch, the popper and crank mashup that is the Riser, and the Dowzswimmer, which is a unique blend of both traditional 3-piece swimbait at a 2-piece glidebait designs. The Dowzswimmer is designed to be an easy to fish S-style swimmer that comes alive with every twitch. Impressions: The first thing that I thought when I saw the Dowzswimmer 220SF was that it looked like a �trout imitator� styled lure, as this big bait has a long slender 8.6 inch profile. The bait is available in six different patterns, some of which exhibit the same lifelike RT patterns found on Jackall�s other baits. 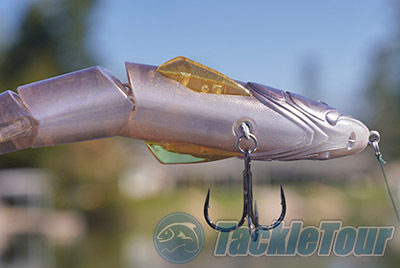 The RT Trout pattern is likely the most popular pattern, simply due to the obvious match with the bait�s profile, but the Ghost Wakasagi looks like a good option for clear water, and the RT Spawn Gill and Hitch patterns will generate more flash, and could be good choices for targeting aggressive fish with faster retrieves. Even though the Dowzswimmer is built with three sections it can be classed as a hybrid type bait, and the design is intended to create something in between a three piece snaking swimmer and a glide bait. In the package the bait looks like it would simply swim back with a hard tail kick, much like most triple sectioned swimbaits, but during moderate retrieve speeds it rocks back and forth in a smooth mid ranged glide-style S pattern. Professional bass angler Takuma Hata (AKA Dowzer) from Japan helped design this bait to exhibit a hybrid style action by giving the front joint a wide swing like traditional swimbaits, and limiting the motion of the second joint, so that the tail section remains relatively tight during retrieves. I was curious if this jointed tail section really made all that much difference to how the bait swam, and wedged in plastic spacers to lock out the movement, and sure enough the bait lost much of the lifelike swimming action, and would not dart nearly as convincingly when twitched. 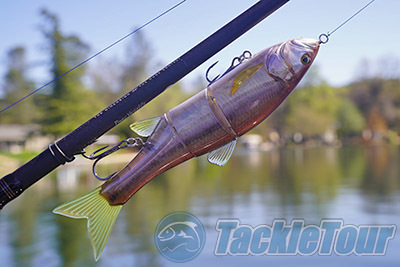 Operation: The Dowzswimmer is a fun bait to fish, but unlike the bluegill imitating Gantarel which I found extremely effective on straight retrieves, this bait does require some additional rod work to really maximize interest from bass. While I did get a few fish to hit the bait on a straight retrieve, it usually took the darting action of the bait to get fish to commit, and when they did the resulting strikes were both violent and impressive. What I really like about the Dowzswimmer is that it can be fished at all speeds, and depending on what the fish want on that particular day you can go slow to entice bass to target the easy meal, or burn the lure when the fish want to pursue and hammer the bait. 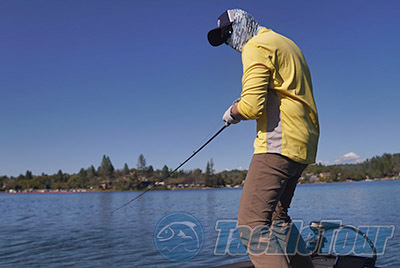 This is one big bait where mixing it up, varying the retrieve speed and action, and not being afraid to experiment to see what the fish are going to respond to most on any given day, will yield the most strikes. When I first looked at the Dowzswimmer my impressions were that it is a pretty good sized bait, but the more I cast and retrieved the lure the more I found that it fished a lot smaller, and lighter, than I initially thought. Weighing in at only 3.6oz. 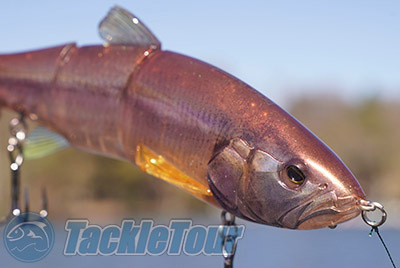 this bait can be fished with even lighter swimbait and casting rods, though I do feel like an application specific swimbait stick is still the best choice.